We sell A. Vogel (Bioforce) products like A. Vogel Prostasan® Saw Palmetto 30 capsules - herbal remedy for symptoms of an enlarged prostate online in the UK and directly from our award-winning store in Scotland. Prostasan® is a licensed traditional herbal remedy used to treat the urinary symptoms of BPH in men with the diagnosis of benign prostatic hypertrophy. A traditional herbal medicinal product used for the relief of urinary symptoms arising from an enlarged prostate, in men with a confirmed diagnosis of Benign Prostatic Hypertrophy (BPH), exclusively based upon long-standing use as a traditional remedy. We sell real A. Vogel (Bioforce) and other Men's Health directly from our shop in Scotland and online throughout the UK. Where can you buy real Prostasan 30 capsules safely online? 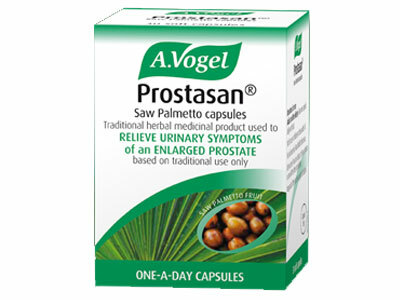 If you are wondering where you can buy A. Vogel Prostasan® Saw Palmetto 30 capsules - herbal remedy for symptoms of an enlarged prostate safely online in the UK, then shop with us. We are an actual health foods shop; with real people selling real foods and products. Our award-winning independent shop is located in Stirling, Scotland since 1976. You can buy our Men's Health in store or safely place an order with us online or over the phone. Prostasan 30 capsules - A. Vogel Prostasan® Saw Palmetto 30 capsules - herbal remedy for symptoms of an enlarged prostate in Men's Health and Herbal Remedies, Tinctures & Supplements.